Imagine someone just subscribed to your email list and allowed you to send them newsletters. They gave their contact information to you. They showed trust in you. So it’s your turn to show some manners in return! Say ‘thank you’. And by doing so, start a conversation. Let’s stop and think for a moment about the power of those two little words: ‘thank you’. A simple ‘thank you’ can have a dramatic impact on how we connect to others. It can make people feel special and promote a positive feeling of goodwill. 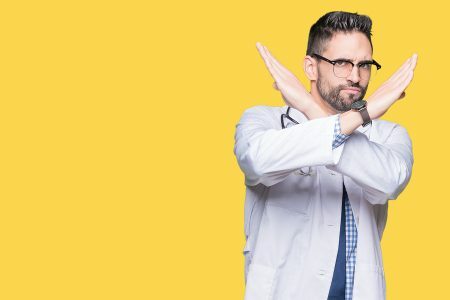 It can help you build strong, lasting relationships with prospective leads, and according to psychologists, it can show you really value what they’ve done for you. ‘Thank you’ truly is one of the sweetest words your prospects can hear. But you’re probably here because you’re wondering how a simple thank you can help you in your business. 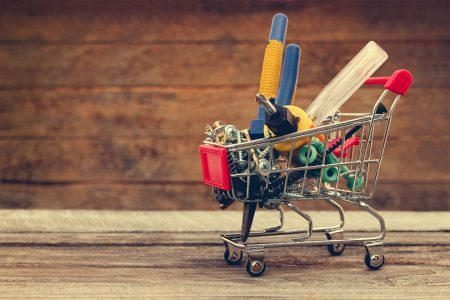 In this post, I’ll share some actionable tips which will help you increase your conversions. Create a ‘thank you’ web page that can only be accessed by people who subscribe to your mail-outs. Put your best content or articles on this page and turn it into a valuable resource. When I subscribed to the Leadpages blog, they immediately served me with a ‘thank you’ page. 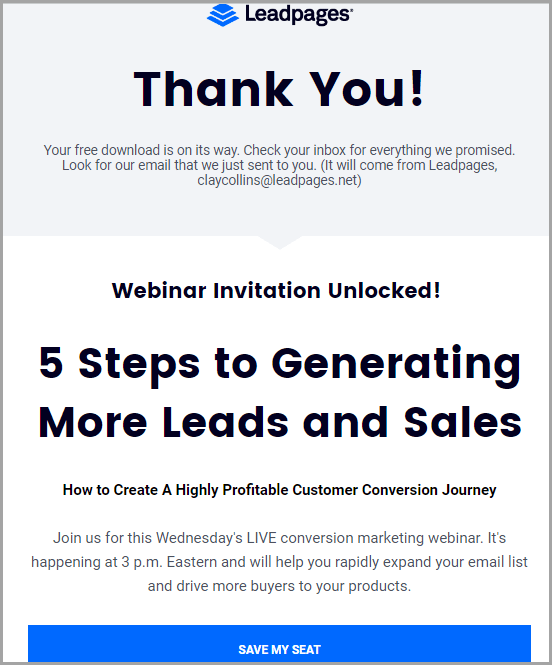 It included the option to save my spot for their upcoming webinar so I could generate more leads and sales. 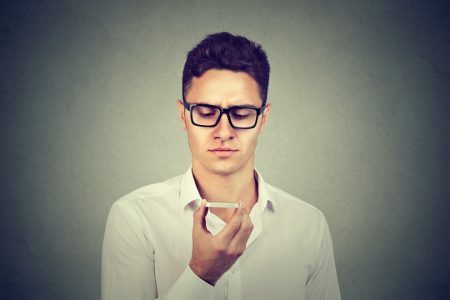 When someone subscribes to your blog or product, you should take the next obvious step and ask them to connect on social media. They’re not just your subscriber – they’re a new community member, so let them know! Always ask subscribers if they’d like to follow you on social channels and let them know there is more than one way to connect with you. 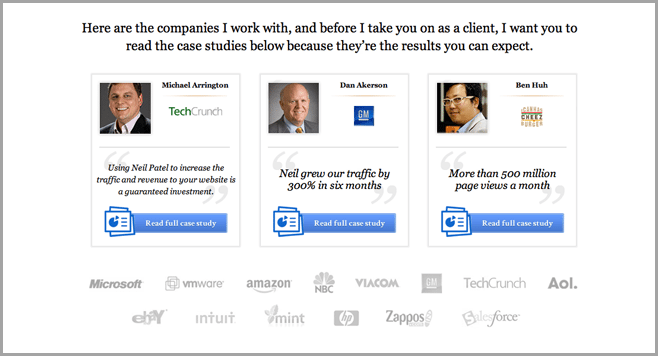 Testimonials are a great way to show your authority and can also help improve your conversion rate. 89% of B2B marketers consider customer testimonials to be the top content marketing tactic. It’s wise to publish your customer testimonials on your ‘thank you’ page to let your new prospective customers know that they can trust you. Don’t forget to publish them on social media as well. 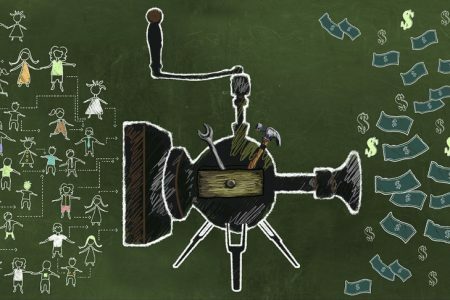 You probably already know that referrals can help grow your business. After all, business is all about networking. If you’re wondering how to get one, your satisfied customers are the solution. Don’t be afraid to ask your customers to help you! If they like what you do, they will. A ‘thank you’ page is actually a neat place to publish a request for referrals. 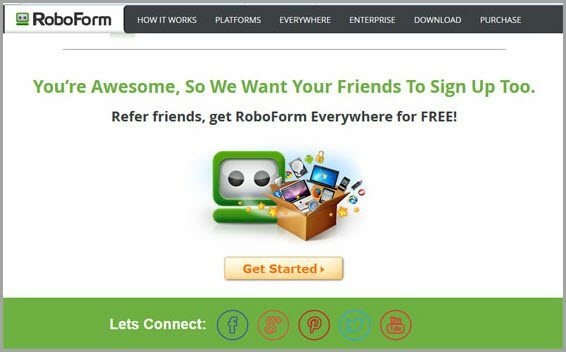 RoboForm provides a great example on their page. Take a look. Once a user subscribes to your newsletters or any service, they should receive an automated ‘thank you’ email to let them know that the sign-up has actually worked. But don’t make it boring or generic! You convinced them to sign-up, now it’s time to entertain them. Use some creative, humorous or unique language in your automated ‘thank you’ message. Did you know welcome emails have 320% more revenue per email than other marketing emails? This is the first conversation with your new subscribers. Make it fun and actionable. 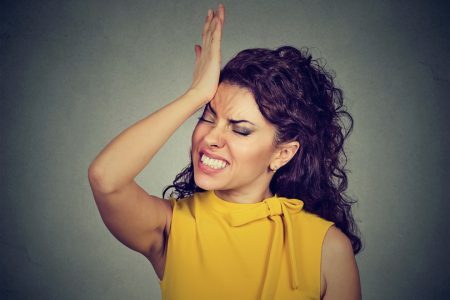 Place a clear call-to-action in it which tells them what to do next. 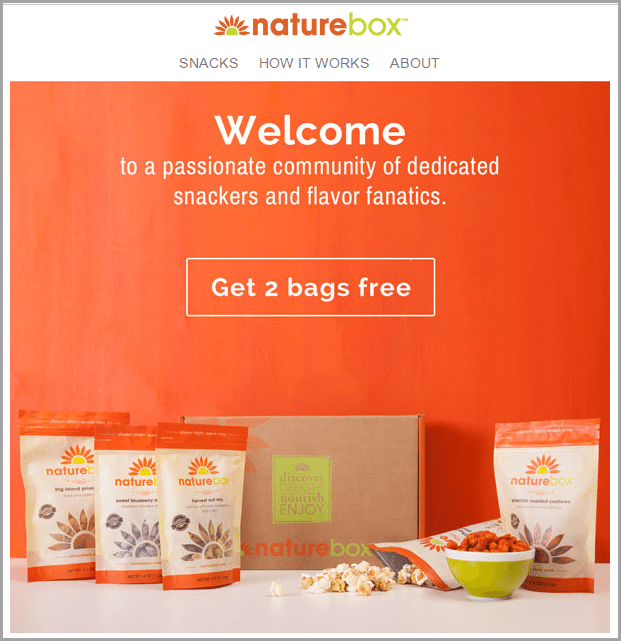 See NatureBox offering two free snack bags for subscribers in their welcome email below. You should use the words ‘thank you’ in your email subject lines wherever applicable to make your message stand out in your subscriber’s inbox. According to research collated by HubSpot, email subject lines that include the words ‘thank you’ have the highest above-average engagement levels. 7. Send ‘thank you’ messages to subscribers who are not active! Send a message to your inactive users and offer them something valuable to tempt them to engage more. I was once an inactive user of Brand24 and got a ‘thank you’ message from the company on their fifth anniversary. In this message, they offered me a 50% discount which actually made me upgrade my account. It was such a nice personalized touch. See below. Do you love receiving handwritten letters and birthday cards? Writing a handwritten ‘thank you’ card or note is a memorable way to show your gratitude to your customer. Handwritten ‘thank you’ cards are old-fashioned in a good way. They show you really care – after all, you took the extra time to write a special and personal note when you could just have emailed. You can also send them small gifts with your note. It will make their day. Think about how special it would make you feel! 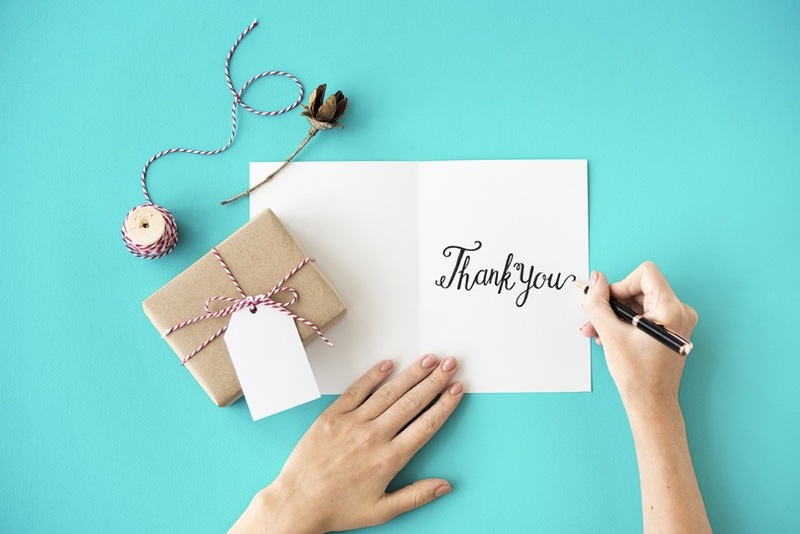 No matter what business you’re in, a simple thank you message can really boost your conversions. So now it’s my turn – THANK YOU for reading this post! I’d love to hear from you in the comments – how often do you say thank you? Do you serve a ‘thank you’ page or have an automated ‘thank you’ email? Let me know down below! Guest Author: Atit Shah is a digital marketing specialist and the founder of Digiblogic. He is a true foodie who loves product marketing, e-commerce, traveling and photography.